The summer months around the shores of Admiral's Point in Trinity Bay, Newfoundland is a very important time in the life cycle of a Capelin. Here the fish love the small pebbles for spawning which will usually take place when the sky is dull and cloudy or throughout the darkness of the night. 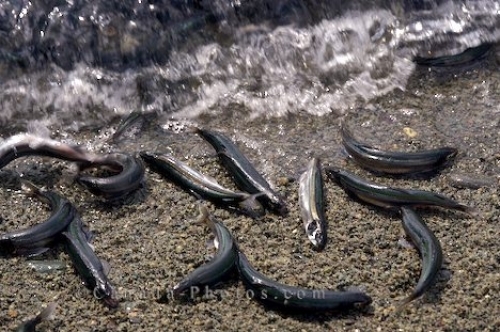 The male Capelin usually school together and flop onto the beach, while the females school in the deeper water until there are ready and then they move onto the beach with the males. Picture of the spawning Capelin on the small pebbles along the beach at Admiral's Point in Trinity Bay, Newfoundland.